It seems as though this is the appropriate card for this time of year. Here at the Roy house we have all been sick the past week, so this is very fitting for us. You just have to love this guy! He's made from the Pick a Petal stamp set (page 115 of the catalog). 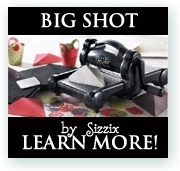 Click here to view the stamp set in the SU! 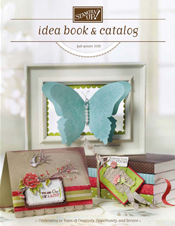 online catalog. I wish I could say he was my creation, but he isn't. I saw him on someone elses blog and unfortunately I don't remember who or I would share the link with you. I used this card at a workshop this weekend and we had the best time making this guy. One lady at the workshop ended up giving her guy a black eye! She accidentally inked up the Basic Black instead of the Soft Sky for one eye! I told her to flip the paper over and restamp, but she really liked him with the black eye and wanted to keep him. She came up with a great saying to put on the inside of the card, but I can not remember it now. This is another card I made for the Stamp-a-Stack a few weeks ago. I used a 6" x 6" piece of Real Red card stock and scored it at 6.5" that way I would have room for the white scallop card stock on the bottom of the front. I then cut a 1" x 6" strip of Whisper White card stock and used my corner rounder punch (removed the guard) and created the scallop edge. Then I used my piercing tool from the Crafters Tool Kit to punch a whole in the middle of each scallop. I was going for a lace look and realize now that I should have used my 1/8" inch hole punch instead...oh well! I used the "Wanted" stamp set and stamped the background with the paisley stamp and Real Red classic ink to give it a watermark look. And I used the "Celebrate" stamp set, which I realized after I stamped celebrate that the "rubbah" was crooked on the wooden block, so I popped it in the microwave for 10 seconds and removed the rubber and tried my best to get it back on straight. 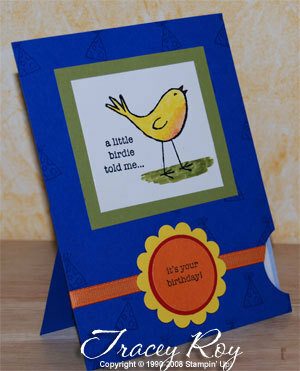 I think I did, but I did not redo the card, because you have no idea how many times I made this card before that!!!! 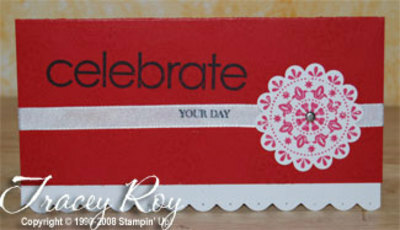 Anyway, I used Jet Black Stazon ink to stamp "your day" on the Whisper White Taffeta ribbon. Don't you just love this little bird?! 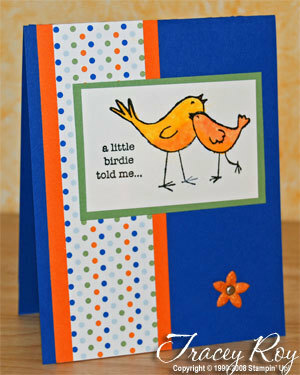 I made this card for a Stamp-A-Stack I did recently for my sister Kerri and her friends. My sister has little ones (a boy and a girl) and they are always getting invited to B-day parties, so she wanted a generic b-day card that she could use for a boy or a girl. I hope this was generic enough! Plus, she loves it when I have them make cards that they can put gift cards in or movie tickets, etc. So I designed this card to have a section on the bottom where you can slide in a gift card, money or movie tickets. But I wanted the card to be able to stand up too. I used a 4.25 x 11 inch piece of Brilliant Blue card stock and scored it at 5.5, 8.25, and 8.75. I accordion folded at the score lines. I think I might need to create a video tutorial for this card, because it's hard to write up the instructions. I'll work on the instructions this week and maybe I can take some pictures as I go to help explain. Or I'll wait till my daughter is home from college this weekend with her digital camera that also records video with voice and she can help me post it to You Tube. It would be my first tutorial of any kind! Here is a card I made for a SAS (Stamp-A-Stack) back in November. 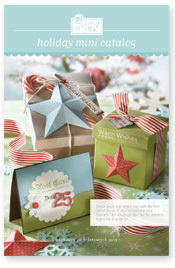 I really wish the Outlaw Designer Series Paper and the satin ribbon were in the new catalog! But we now have Western Sky which is basically the same design just different colors. I'll need to put that on my wish list for the next order! 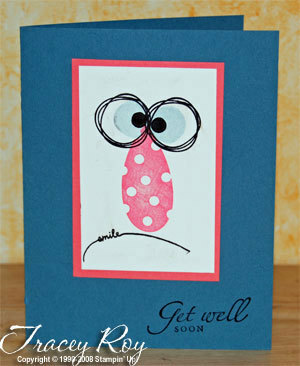 I used the Wanted stamp set for the scallop and circle punches and the "Thinking of You" is from the Sincere Salutations stamp set. I love that set and use it all the time. As a matter of fact when I made this card several times I stamped "Birthday Wishes" and "Thanks So Much" on the other ones. My husband ended up using the Birthday one for our nephew. He said it was masculine enough. Or maybe he just didn't want to deal with looking through more cards! LOL! 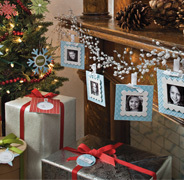 I then used the Tag Corner punch on the corners. I used my Crafters Tool Kit to punch the edges all the way around and used my white gel pen drawing a line every other hole to make it look like stitching. I stamped a flower from the Three for You Punch set and punched it out and inserted a rhinestone brad in the middle going all the way through the front flap of the purse. For the handle I used my Crop-a-Dile to punch 1/8" hole a half inch in on both sides. I adhered the ribbon on the inside because if you tie a know then the purse won't close properly. 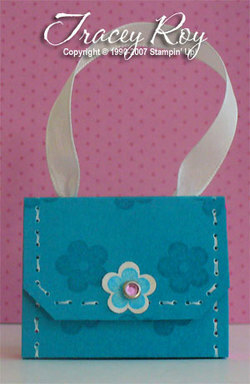 I used SNAIL adhesive to adhere the Post-it Notes to the inside of the purse. If I missed anything or you have any questions feel free to leave a comment or email me. Well my first open house was a success! I had 8 people in all attend and I think everyone had a good time. 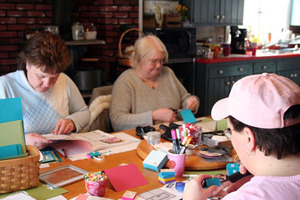 As you can see from the picture everyone was busy making cards or browsing the new catalog. Angela was the winner of the door prize. I know I promised to get the instructions for the 2 cards and the mini post-it note purse posted on Sunday, but I just didn't get to it. Yesterday I spent the day making swaps for my upline Carolyn's meeting. I used the Embrace Life card from the open house, but I had to make some changes since I didn't have enough of the same designer series paper. And this is where I always get into trouble. How you ask? Well, my brain starts going and then I think of additional things I can do to improve the card. 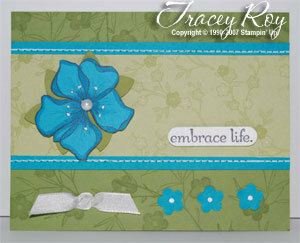 Here is the new version of the Embrace Life card. You'll want to compare this picture to the picture in my previous post. I outlined the flower petals with the brush end of the Taken with Teal marker and also used the marker to make the center of the flower have some dimension. I used the fine end of the marker to draw veins from the center of the flower too. Note: I had this post all typed up earlier while watching Lost and then previewed it and clicked on the back button and lost the whole post. It took me 1.5 hours to type up (between watching and reading the subtitles on the screen...those of you who watched Lost will understand). So now I'm really tired and it's way past my bedtime so I just gave you the list of supplies I used for the card. 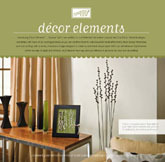 If you need additional information, feel free to email me and ask. 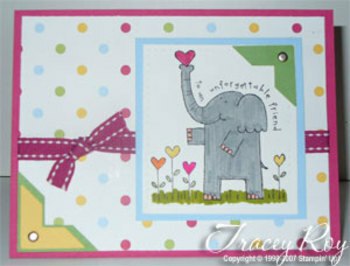 Tomorrow I will post the info for the Elephant card and the Mini Post-it Note purse.